Added on July 7, 2017 by Sam Sala. Added on July 1, 2017 by Sam Sala. A crowd of over 60 gathered at the Glenroy Bowling Club on Sunday 25 June to mark the end of the first term of Worshipful Brother Don Wilkin PGStdB as Worshipful Master ofBrunswick United No 924 and to welcome him as Master-elect for 2017/2018. Very Worshipful Brother Philip Scharp PGIW, the Lodge's Director Ceremonies, acted as Master of Ceremonies, performing his duties with the polish we expect of him and thus ensured a smooth transition to the many activities on the agenda. He did, however, appear to have some difficulty with the difference between his afternoons and evenings; MC –“afternoons”, DC –“evenings”. The usual delicious lunch (3 courses) was presented by the Wizards, Kevin and Marie and nobody should have left unsatisfied or feeling the need for dinner. Brother Don spoke about his first year in the Chair of King Solomon and thanked his Office Bearers for their support during the year. He is looking forward to his next 12 months in the chair and the challenges that lay ahead. Ceremonially, 2016-2017 has been 'full on' for the Master and his Team, with a Degree ceremony at every meeting. Even the traditional 'night off' in December was a Degree ceremony. However, relief is in sight - there may be at least one 'free night' in 2017-2018 (but no promises!!!). A highlight of the afternoon was the entertainment provided by two 'unknowns' playing string instruments. Additionally, there was a traditional bush yarn, raffle prizes including baskets of fruit and vegetables for good health, door prizes, surprise presents and other activities to round out the day. One of the winners was Worshipful Brother Bill Schoof and wife Val; they left with a large roast leg of lamb in a “tucker bag” courtesy of Brother Tom Ioannou. But perhaps the star of the day was Makayla Scharp. Makayla (just 10 years of age but growing up fast) gave a professional performance on the violin and enthralled the audience (especially proud grandparents and parents) with 3 beautiful tunes from her extensive repertoire. She had all of the “Matildas” waltzing in their chairs with the last one. Philip also took the opportunity to speak to all brothers present about the men’s health checklist; provided by Grand Lodge at the last Brunswick United Lodge meeting. He reiterated the key elements listed and some of us are already receiving assistance from our partners with some elements! A special thanks to the behind-the-scenes crew (Mike, Val, Colin, Yvonne, Don and Lorraine) who helped set up, purchased prizes, handled the finances to ensure we all had a great day!. Added on April 30, 2017 by Sam Sala. You are cordially invited to join the Master and brethren of Fairfield Lodge for lunch and an afternoon of music. Added on June 27, 2016 by Sam Sala. 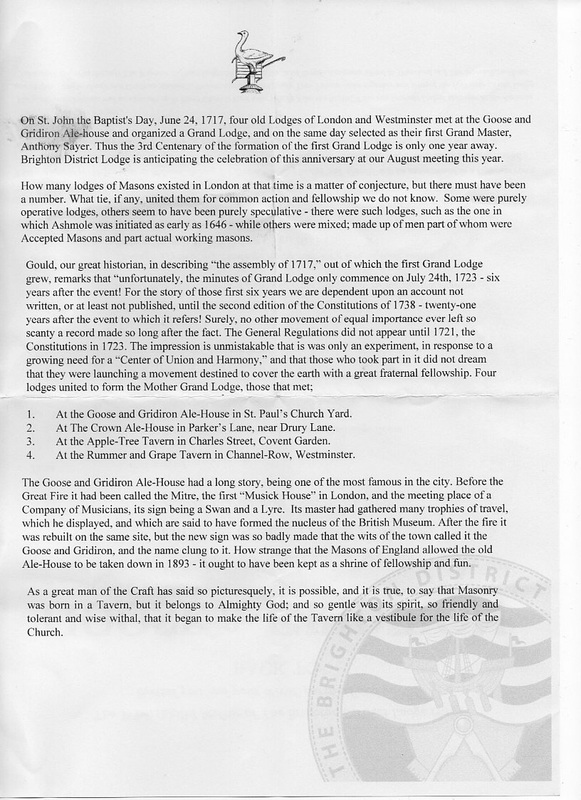 Please find attached two Notices for Brethren, Family and Friends, for upcoming events of the Sunbury Lodge. In particular the non ceremonial night is a great chance to bring along perspective members for a perspective of what Freemasonry does and who is in it. It will be a fun and informative night, and if there are sufficient perspective brethren in attendance we will change the program to include a little about what freemasonry is and why they might consider joining. Please feel free to pass this on to others who might think have an interest in genealogy.